What you need is a good local butcher, which these days can be very hard to find. I'm lucky in the fact that since I moved I got Ray, who runs R G Park Butchers, as my local butcher. I've been wanting to try and cook ox cheeks for quite some time so the other Saturday I nipped around the corner to see what was on offer in the butchery. I was quite pleased to be able to pick up two ox cheeks for Sunday dinner, it's nice when a plan comes together. Never mind, I thought I'd give it a go when I got home. This is when I realised that my course with Nathan really had paid off. It might not have been butcher quality, but the effort I put in was hundred times better than what I could have done before this course. If you're not close enough to London, or maybe not even living in England, for it to be feasible to attend one of Nathan's courses, do try and find one locally. Getting better knife skills and understanding for butchery is really worth it if you are serious about your cooking. Place the ox cheeks and pancetta in a big bowl and add in all the other ingredients for the marinade. Cover the bowl and let it sit in your fridge over night. The next day, remove the cheeks and pancetta from the marinade. Sieve out the vegetables and herbs, making sure to keep the wine. Pour the wine into a pan and start reducing it. Remove it from the heat when it has reduced by half to two thirds. Dry off the ox cheeks and pancetta with some kitchen towel. Heat some olive oil in a frying pan and seal the ox cheeks on both sides, making sure to get them well and nicely browned. Pop them into a oven safe casserole dish. Now fry the pancetta, optionally adding some brandy, until they catch some colour as well. Pour this into the casserole dish as well. Pour the reduced wine into the casserole dish, add in the vegetables, ground pepper and then enough stock to barely cover. Cover all of this with a double folded piece of parchment paper and put the lid on the casserole dish. Put the dish into the oven and cook for 2 1/2 - 3 hours. Remove from the oven and allow it to cool down. Remove the fat that rises to the top. Return the meat and veg to the casserole and heat through gently before serving. Serve with mash and chopped parsley. Waitrose has been selling ox cheeks for a fair while, priced at £5.99 a kilo, already trimmed. If there's a little membrane on them, the counter butcher removes it for me, he also cuts them into pieces for me if I ask. 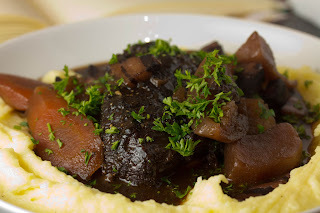 I've got a post written and on the blog, scheduled to go up soon, but its behind some other posts, for a beef cheek bourgignon. Superb! I haven't been able to find it in the Waitrose's in Abingdon or Wallingford but it might just be that I get in too late. After my courses recently I quite like trying to trim the meat myself. I'm doing a much worse job than what someone who's properly trained would do, but it's quite good fun. I have two great local butchers, one 10 minutes walk from my house, the other a bit further and they both have been displaying cheap cuts a lot more so it's definitely a trend. It's ace to have proper butchers locally. Some of these cheaper cuts needs some extra tlc to get nice, but once you've done that you get so much back for a small cost. Sounds good, Mike! Braising is my favorite cookery method, and beef and red wine are a magical combination. It is such easy cooking. Once you got it all sealed and in the casserole dish you can just let the magic happen all by itself. You are not wrong there, there's something that just makes those two go together so nicely.